A backed up sewer line can lead to Big, Big issues if the problem is not addressed quickly by a professional plumbing company like Streamline Plumbing. Many times the real issue has to do with what’s happening outside (think trees and roots), and not inside your house. Once you notice even the slightest amount of change with your drainage system, you need to take action and figure out what is actually the problem. If need be, Streamline will provide a video sewer inspection and determine the exact situation. With modern technology, trenchless sewer repair is a viable option that is faster and cheaper than the old way of just tearing up your yard and landscape. Basically this approach (trenchless repair) offers a few main access points that minimize the overall destruction of your yard / landscape. Our plumbing technicians at Streamline are experienced and always put our customer needs first, so contact us today for a Free Estimate. 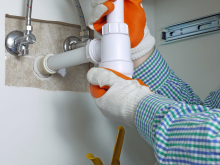 Streamline Plumbing has helped 1000’s of homeowners diagnose and repair old and faulty drains. The majority of drain stoppages can be fixed with just a standard drain-cleaning snake, but for the larger problems we can also help with hydro-jetting, video sewer imagery, etc. Streamline Plumbing has expert technicians that can handle any problem, on time and on budget. Contact Streamline Plumbing today if you need a second opinion (estimate) to make sure you are not paying too much for your repairs. With over 25 years experience we take great pride in being a family owned company that offers affordable pricing and professional service. Our staff is tidy, experienced, and customer focused, which is why we have been around Orange County and Los Angeles for over 25 years. Call us today or email us here from the website to schedule an appointment at your earliest convenience. More affordable than a pipe re-route. Same day service available during emergencies. No hidden costs – know your charges upfront. Over 25 years of professional plumbing experience.